Learn more about us and our work in this short information FILM! Since 2016 My Afrika Volunteers have been running a resource center in Kampala. The center is completely driven by volunteers and donated means. It is open Monday to Friday from morning to evening. Here children and adolescents can spend time to play, study, learn new skills like computer training and knitting. 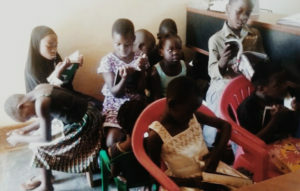 It’s also a place for neglected children spend their holidays and afternoons – or even every day if they are not able to go to school because of school fees. All of the volunteering staff at the center are graduates and besides from caring for and teaching children they offer counselling and coaching for anyone who wish – adults, adolescents and also children. There are many young people who face abuse at home like corporal punishments and My Afrika Volunteers is committed to fighting this vice through education; teaching the abused and the abuser. Frustration in a home leads to physical and mental abuse of children by their carers and parents, My Afrika Volunteers’s mission is to make the lives of young people better. This is very important because Uganda’s population is made of over 65% persons under the age of 30 years. So, it is our duty and mission as My Afrika Volunteers and our friends to see to it that where possible we contribute towards making sure that these young people are equipped with the necessary tools both mental and physical for the future. Sadly the education system in Uganda is still colonial it does not equip the young people with skills in this modern world. It was designed to meet the needs of the colonial masters in our case the English. We are happy to report that this has been realised and change is on the way, but like all change it will a long time especially in Uganda even that we have limited resources as a nation. My Afrika Volunteers has decided to start helping some young people with school fees. The resources are unfortunately small and the line of kids unable to go to school because of school fees is long. My Afrika Volunteers and the sponsored students are greatly thankful for the small amounts of sponsors, from mainly Sweden, we have got today. Learn about how you can become a sponsor and support (and follow) a student through her/his schooling HERE. During the school holidays our Director William Mutumba together with other volunteers who are trained in different fields like Nursing, medicine, counseling etc. conduct classes for the young people using our local church as venue. The course is conducted over a period of a few days. We have a demand from the students to conduct it more times during the year but due to un limited resources we can only afford once or twice a year.